We know that many schools across the UK are caring for children with Type 1 diabetes brilliantly because parents have told us. That's why we're celebrating and showcasing the fantastic care they provide through theGood Diabetes Care in School Award.As part of theType 1 diabetes: Make the grade campaign, this exciting award recognises the schools that are making sure children and young people with Type 1 diabetes get the most out of their time at school. 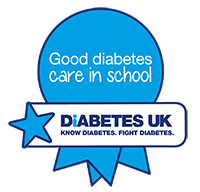 Congratulations to the Good Diabetes Care in School Award holders in East Anglia and Bedfordshire, Diabetes UK officially recognises that these schools deliver effective diabetes care and management. View the winning schools in your area below, and view the national winners by going to ourhonour wall. When I asked my child what was the best thing about school, she said having her Teaching Assistant nearby so if she has a hypo she's there to help her and she doesn't have to go anywhere. The school have always worked closely with the diabetes team and the family to keep fully up to date with training. Holland Park Primary School, Essex. The care my daughter receives in school is second to none, nothing is too much and I can honestly say she has been treated like gold. The school have always been totally committed to ensuring that the student is able to fully participate in school life including lessons, activities and extra-curricular events. I can truly say from the bottom of my heart, that I feel so lucky and proud of this fantastic school and highly commend them for their exceptional diabetes care they give in their school. The Medical Officer is always proactive, assuming excellent care for both children who have different insulin delivery methods. The school have ensured that my daughter has a brilliant one to one Teaching Assistant. Staff at his school have been incredibly supportive to the child. The school have allowed my son to be as open or private about his diabetes as he wants to be. They take it very seriously so he doesn’t have to worry about anything. The school has been excellent in supporintg this child and his family. I feel this school goes a long way in their provision of care, far exceeding all my expectations. The school recognises its duties and allows pupils with diabetes to thrive in their individual educational ability. We have been delighted with the care and support offered by the school, in particular the secretaries. St.John’s Primary School have been exemplary in their care for their pupil with diabetes. My son's levels can be very irratic at times, having a school who has taken care of him since he started there has been a massive help to me. The staff have been a pleasure to work with. This child required a high level of care as he wears an insulin pump. His needs have been met with a very high standard of care. There is never any question of my son bieng left out or sidelined. The school works well with us to overcome any possible issues or to ensure constant care at a high level. This school has always been able to put the young pupil first by identifying staff to his aid as soon as his diagnosis was known. The school has been very supportive in learning how to care for my daughter, having all the relevant training to administer her insulin injections and letting me know in advance of events happening in the school to provide snacks and information they need to care for her. The school welcomed teaching and were willing to be trained to administer insulin. Recently the child has started on an insulin pump and the school has embraced the teaching. This training, especially with her classroom teacher, has helped reduce anxiety that can be often be felt. The school employed a staff member to work with my daughter who has knowledge of diabetes. I am grateful for the care and desire of the school to want to make a difference and provide the best possible care for my daughter. The school offers an exemplary level of diabetes care to each child. They ensure that the students participate in school life like their peers. The staff and SENCO have been very proactive in seeking information and support. All staff are very supportive of my child's needs and give her all the help she needs. They are attentive when testing her blood sugar levels and always check with us if not sure of anything. We have no worries at all about her care whilst in school. The school are very understanding of Type 1 diabetes care, They have welcomed training sessions that were well attended. The staff are keen for the student to integrate fully in school. If there are any problems they understand who to call and communicate well with parents. The care and support that this small school have offered our family has been outstanding since diagnosis 14 months ago. The staff have been so attentive to this young person and their family since diagnosis. The staff have embraced the support of the pupil and family exceptionally well. They treat my son with the care and attention he needs on a daily basis. The school is able to provide a high level of care, expert training in helping my child and terrific communication. The school has made sure the student is never excluded from any activity in school. They have provided sufficient staff to be able to look after the student. My son is given the same opportunities at school as other students and allowed to join in after school clubs. They have had staff trained by his diabetes specialist nurse including his teachers and teaching assistants. The school is welcoming and supportive to all students who have had Type 1 diabetes attending the school over the years. The school recognises its duties as detailed in the Children and Families Act 2014, allowing pupils to be included and thrive in their individual educational ability. The care is of the highest standard. I feel very relaxed leaving my son at school. The meals are measured and amazing. The mother of the child is extremely satisfied by the level of care her child receives. He was able to attend fist school trip away with school, without having his mother accompany him. The school has supported my son and our family, allowing him to go on school trips. The staff saw that my son was unwell and a diagnosis of diabetes was discovered in school. The school have worked very hard at having good communication with the family and other professionals. They have worked hard at being inclusive and making diabetes management part of their day to day life in school. My daughter thoroughly enjoys learning at school and feels safe in the care of her teachers.. The standard of care is exceptional, always giving my daughter reassurance when checking blood glucose levels, taking time to consider reading and carb count all foods, The also take info consideration how other factors such as illness and stress have on her glucose levels. The school maintains good contact with our service and will always call the diabetes team if they have any concerns the parents can't help with. The staff are very supportive of the students and of each other when managing the students' diabetes. The school have not singled my daughter out or made a big deal out of her condition. The staff have shown an interest in learning about diabetes, and all the staff are willing to have training to ensure my child's day-to-day care is available at all times. They have gone above and beyond their duties in caring for our patient. He has great relationship with staff who are extremely knowledgeable with his management. They are receptive to training and accommodate changes with a willingness and enthusiasm. Since my son was diagnosed the school has always worked with me to make sure he is kept well. They also read a book to each class to explain to the other children about diabetes. They are a very caring and supportive school. The school offers constant and continuing care for my son. They support him every day and he never misses out on any activity and never feels excluded. They allow his diabetes to be reviewed in school time and provide great support to our team for this. They are a pleasure to work with as a pediatric diabetes nurse. The School are amazing and I fully support them, I know personally how happy the mum of their diabetic child is with the care he gets. The health and welfare officer, Sue Hodgson, is an absolute joy to have in our school and I know I would panic if she wasn't there to watch over my grandson. The health and welfare officer, Sue Hodgson, takes close interest in this child's diabetes and emotional well-being. She keeps careful records of BG readings, meets with this child everyday and ensures the insulin is given at school. The school is brilliant. The first day my boy returned to school we had no worries at all. Considering our son is the only Type 1 diabetic child in his school, the enthusiasm to help him and us was and still is amazing. He is treated like any other pupil. The school always get new staff, that are involved with the patient, trained in all areas of diabetes. His control is always very good within school time. The healthcare worker is always very supportive of my child's needs on a day to day basis. She'll always contact me if there's an issue. She understands teenage negative behaviours with diabetes and will help my child get back on track. St Helena has always been willing to work with the Team in ensuring the best care for their pupils. They take very good care of my daughter and ensure she has everything available to check and treat her diabetes. They never make her feel different. They are very inclusive. They are all amazing. They requested extra training for each individual child at the school. Actively seeks ways to include all children in activities. Work in partnership with families and the diabetes team. Awareness in the school is just amazing. The whole school really got involved. I couldn't be happier. The school has managed the child's diabetes really well. They take part in all aspects of school life. The staff are proactive in ensuring all care plans are up to date and they keep their diabetes knowledge up to date. The best thing the school has done is to listen and understand as to arrangements my daughter requires. She is very relaxed as a result. Good correspondence with the diabetes team. The student's management of diabetes is perfect, one hundred per cent. They make me feel at ease. They are fantastic and caring. I don't have to worry when she is at school. The staff are good at communicating with parents and the diabetes team to provide best care for the children.